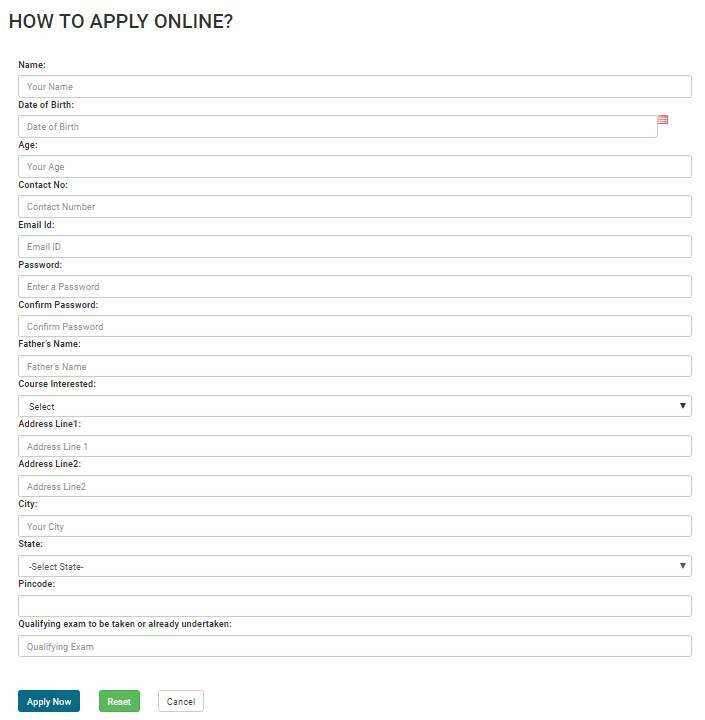 Fill up the basic details for admission. Fill in the declaration form. Attach required documents & mark sheets. Collect the application form from the college campus. Applicants will be selected based on the merit of the candidate's performance in qualifying exams. 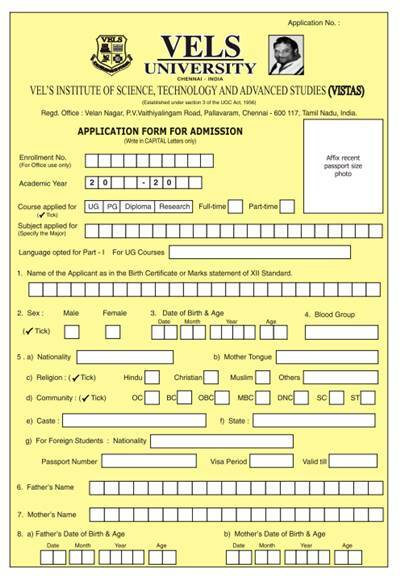 The candidate should have passed 10+2 examination with Mathematics, Physics and Chemistry as three of the four subjects or any examination of any other authority accepted by the BOM of Vels University, Bangalore as equivalent thereto for BE, Bio-Medical and B.Tech Biotechnology apart from MPC, Biology as a fourth paper is preferable. The candidate should have passed the Diploma in Engineering / Technology from a recognised board or its equivalent is eligible to apply for Lateral Entry admission to the third semester of B.Tech in the branch corresponding to the branch of study. The candidate should have the degree in Science, B.Sc with Mathematics as a subject are eligible to apply for Lateral Entry admission to the third semester of B.Tech. Candidate should have passed in 10+2 or its equivalent examination with minimum 55% aggregate in Physics, Chemistry and Mathematics subjects and 55% in English at 10th or 12th Standard from a recognised board. He/She should be in between 17 to 25 years of age as on 31 July. Candidate should have a passed 10+2 or equivalent with a minimum of 50% from a recognised university. Candidate should have a passed any Bachelor's Degree with 50% from a recognised university with 10+2+3 pattern of Education. Candidate should have completed B.Tech / BE in any discipline, B.Sc (Maths Statistics), BA (Economics / Maths) B.Com, BCA, B.Sc Computer Science, BBA, BBM, with minimum 50% marks from a recognized University in 10+2+3 pattern of Education. As per BCI norms, for admission to VELS University, Chennai the candidates should have passed 10+2, from a recognised board or equivalent. Candidate should have passed in 10+2 or equivalent with Maths or Computer Science / Business Maths / Statistics. The candidate should have passed 10+2 or its equivalent Examinations with minimum 60% aggregate in Physics, Chemistry and Mathematics group, and at least 50% in English at 10th or 12th. Candidate should be 17 to 25 years as on 31st July of the year of admission or the date of commencement of the course, whichever is earlier. The candidate should have passed 10+2 examination with Mathematics, Physics and Chemistry as three of the four subjects or any examination of any other authority accepted by the BOM of Vels University, Bangalore as equivalent thereto for B.E. Bio-Medical and B.Tech Biotechnology apart from MPC, Biology as a fourth paper is preferable. The candidate should have passed the Diploma in Engineering / Technology from a recognised board or its equivalent is eligible to apply for Lateral Entry admission to the third semester of BE / B.Tech in the branch corresponding to the branch of study. The candidate should have the degree in Science, B.Sc with Mathematics as a subject are eligible to apply for Lateral Entry admission to the third semester of BE / B.Tech. For admission to VELS University, Chennai the candidate should have a UG/PG degree from a recognized University. Candidate should have passed 10+2 examination or equivalent from a recognised university with Physics, Chemistry, Maths or Biology / Botany and Zoology as subjects, as per norms of PCI. Candidate should have a minimum of 50% marks in aggregate in Physics, Chemistry, Biology / Botany & Zoology. A pass in 10+2 or its equivalent examination with minimum 60% aggregate marks in Physics, Chemistry and Mathematics group, and at least 50% marks in English at 10th or 12th Standard. As per BCI norms, the candidate should have a passed UG/PG from a recognized University for admission. Candidate should have passed his Bachelor's degree with a specialization in Astrology. Candidate should have at least any one degree: BA / B.Com / B.Sc / BBA with Part-II English at Bachelor's level. Candidate should have any degree in Maths or Statistics or Mathematical Physics as main/allied subject as eligibility for admissions. The candidate should have a Bachelor's Degree of minimum 3 years tenure in BCA, B.Sc (IT/ Computer Science) with Mathematics as a subject at 10 + 2 level or at Graduate level, with minimum 50% (45% in case of candidate belonging to reserved category) at the qualifying Examination. Candidates should have passed BE / B.Tech (ECE / Electronics) or BE / B.Tech (EEE / ECE / Electronics / IT / CSE / I&C / E&I / Instrumentation / or MCA or M.Sc 5 years integrated (IT / CS / Software Engineering). Candidate should have passed BE / B.Tech (EEE / ECE / I&C / E&I / Electronics / Instrumentation). Candidate should have passed BE / B.Tech (Mech. / Auto. / Production / Manufacturing / CIM / Metallurgy / IE / Mechatronics). Candidate should have passed BE / B.Tech (Civil). Candidate should have passed BE / B.Tech/ AMIE (Civil, Chemical, Geoinformatics. Biotech, Ind.Biotech, Energy & Environmental Engineering. Candidate should have passed BE / B.Tech (Auto/ Mech/Production/ Manufacturing /Mechatronics). Candidate should have passed BE / B.Tech (ECE / Electronics ) or BE / B.Tech (ECE / Electronics) or BE / B.Tech (EEE / ECE / Electronics / IT /CSE / I&C / E&I / Instrumentation). Candidate should have B.Pharm degree from recognized University and PCI. For admission to VELS University, Chennai, the candidate should have a BPT Degree from a recognized University. Candidate should have any B.Sc Degree in Computer Science to be eligible for admission. Candidate should have any degree in Maths or Statistics or Mathematical Physics as principal/allied subject. Candidate should have a degree in B.Sc, H.C.M., Nutrition, Food Service Management & Dietetics. Candidate should have a degree in B.Sc Hotel & Catering Management. Candidate should have a degree in B.Sc Chemistry. Candidate should have a degree in B.Pharm / B.Sc in Chemistry / Biochemistry. Candidate should have a degree in Biochemistry, Chemistry, Microbiology, Nutrition & Dietetics and Life Sciences with (10+2+3 pattern). Candidate should have a degree in Microbiology, Botany, Zoology, Biology, Life Science, Biochemistry, Biotechnology, Nutrition and Dietetics, Home Science, Plant Science and Medicine with (10+2+3 pattern). Candidate should have a degree in B.Sc with Zoology, Botany, Chemistry, Biology, Biotech, Biochemistry or Microbiology to be eligible for admission. Candidate should have a Biotechnology & Clinical Research Degree in B.Sc with Zoology, Botany, Chemistry, Biology, Biotech, Biochemistry, Microbiology, Home Science, Physics, Genetics, or B.Sc (Agri), B.Vsc, B.Fsc, BDS, MBBS & B.Pharm with (10+2+3 pattern). Candidate should have a Bachelor’s Degree in Genetics, Biology, Biochemistry, Biotechnology, Physics, Chemistry, Computer Science, Botany, Zoology, Microbiology, Mathematics, Statistics, Nutrition, Foodservice Management & Dietetics, Agriculture, BE/ B.Tech (Biotech), B.V.Sc, MBBS, BDS, B.Pharm, BPT & BCA with (10+2+3 Pattern). Candidate should have a degree in BE / B.Tech degree in Mechanical, Civil, Naval Architecture, Ocean Engg, Petroleum Engg., Mechanical and Automobile Engg., Metallurgy, Aeronautical Engg. with 55% marks scored in English in 10th or 12th Standard. Candidate should have studied Physics, Chemistry, Maths or Biology / Botany and Zoology as subjects as per norms of PCI. Candidate should have passed 10+2 examination from a recognised university. They took on the basis of cutoff marks and science Background as well for my course at VELS University. Flying squad is always in aware while the semester exams time. Exams have been conducted in a strict manner. No entrance exam is needed to get admission in VELS University. Minimum 50 marks are enough for admission. No cutoff This clg is also meant fr average student too. Candidate must have passed the 12th from a recognized institute to get admission in this college. No separate entrance exam is conducted. Minimum 70% cutoff mark is required. This is B.Tech, Naval Architecture & Offshore Engineering Eligibility: 55% marks (Physics, Chemistry, Mathematics) Entrance Examination. Min. 60% in 12th PCM and valid 10th certificate. Entrance exam- CET Candidate should be physically fit. A medical certificate is required. The student must pass the 12th grade with the good percentage to get the admission in this college. There is no cutoff. No particular eligibility criteria for admission. The student must pass in UG with good marks. No cutoffs as far as I remember. Students must pass 12th exam and there is no entrance exam. There is no cut off for my course. Eligibility criteria HSC with 70%. Entrance is not required for this course. Should have scored 65%. Should pass your 12th class. No need entrance exam. I did not attend any entrance test. The entrance exam is required. The average cutoff for passing the entrance exam is 40%. whats the ranking of VELS university? VELS university is ranked 31st by Tamil Nadu state ranking. whats the contact number of VELS university? 044 2266 2500 is the contact number of VELS university. whats the fees for marine engineering at VELS university? 9,87,500 Rs. is the fees for marine engineering. what are the different courses available under MBA at VELS university?